Fruits. Davao City and its environs are chock-full of fruits, foremost of which is durian. Durian has an ovoid shape and covered with spikes. To some, it tastes sweet, a bit creamy, and sometimes bland, depending on its ripeness and its variety. What's undeniable is its strong, pungent smell. It is rich in vitamin C which boosts immunity as well as tryptophan which induces sleep. Aside from durian, you will most likely spot some pomelo. Pomelo is similar to an orange, but it is larger with a thick rind. Its flesh can be white, pale yellow or pink. It can be eaten as is or as an ingredient in salads. You can also spot mangosteen in Davao City. It is a round, purple fruit and slightly smaller than a fist. Its flesh is white and sweet. Mangosteen has antioxidants that lessen the impact of free radicals on your body. More than these, the city also offers other fruit choices like rambutan, lanzones, marang, bananas (both plantain and table), mangoes and dragon fruit. Delicacies. To lengthen the shelf life of fruits, several ways have been employed, resulting to the many delicacies Davao City has to offer. There are durian candies, durian tarts and durian chips. These could be alternatives to those who can't stand the smell of the fresh fruit itself. Green mango, macapuno and guyabano jams and other sweets are also available. Wines from bignay/bugnay and pineapple have also found their way into the city's shelves and cellars. Coffee and chocolate. A lot of the coffee produced in the Mindanao region come from the Davao area (Davao del Sur, Davao del Norte, Davao Oriental and its neighboring towns). Packaged coffee ready for selling, thus, comes to Davao City -- being one of the region's commercial hubs. The Arabica variety is often grown. Aside from the usual coffee beans, there is also civet coffee. Civet coffee is highly prized/priced because of its taste and aroma. It also has low acidity and characteristic sweetness. In civet coffee, coffee berries undergo a strict quality control by civet cats that choose only ripe and sweet berries. Once the civet cats have determined the quality of the berries, they eat them. The chosen coffee berries go through organic processing inside the cat's digestive tract after which they shall be excreted. Harvesters then collect the excrement, dry, roast and package them -- ready for selling. Cocoa beans are also grown in Davao and made into cocoa tablets (tableya) or bars as ready-to-eat treats, beverage or as an ingredient for cakes, cookies and other pastries. Jewelry. South sea pearls are often sold in the shopping centers and malls of Davao City. Some stores offer a certificate of authenticity. For sellers that don't, buyers can check by rubbing the pearls against their teeth. If they are rough and have imperfections then they're likely real; smooth ones are fake. Real pearls that are part of a strand usually have slight variations in their sizes and color. Diamonds and gold jewelry are also sold in jewelry stores in malls and commercial districts in Davao City. Accessories. Accessories found in Davao City are not limited to the modern, mainstream and trendy ones. Each tribe of the ten tribes that inhabit Davao City also have their own distinct accessories. Their accessories can be adorned with embroidery or made of beads, brass, wood, silver, synthetic gemstones and leather, abaca fibers or the coconut's endocarp. 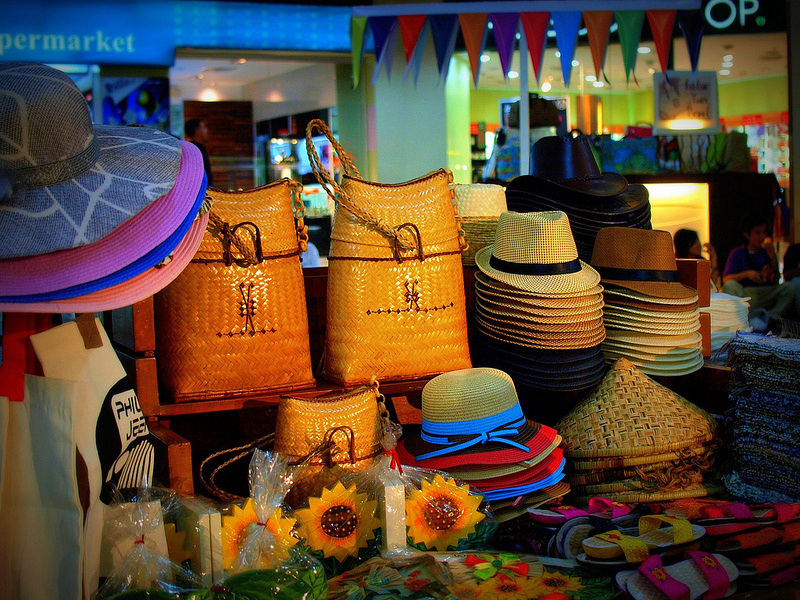 Likewise, there are bags, hats, belts, clutches and purses made of straw, grass (tikog) and indigenous fibers like abaca -- in varieties referred to as t'nalak, dagmay, or sinamay. T'nalak fabrics are dyed naturally by women of the T'boli tribe. Each pattern of the fabric is not woven based on a trend. It is a product based on the dreams of the weaver. Every product made of T'nalak is an embodiment of the T'boli's culture, traditions and beliefs. Home furnishings, handicrafts and decor. 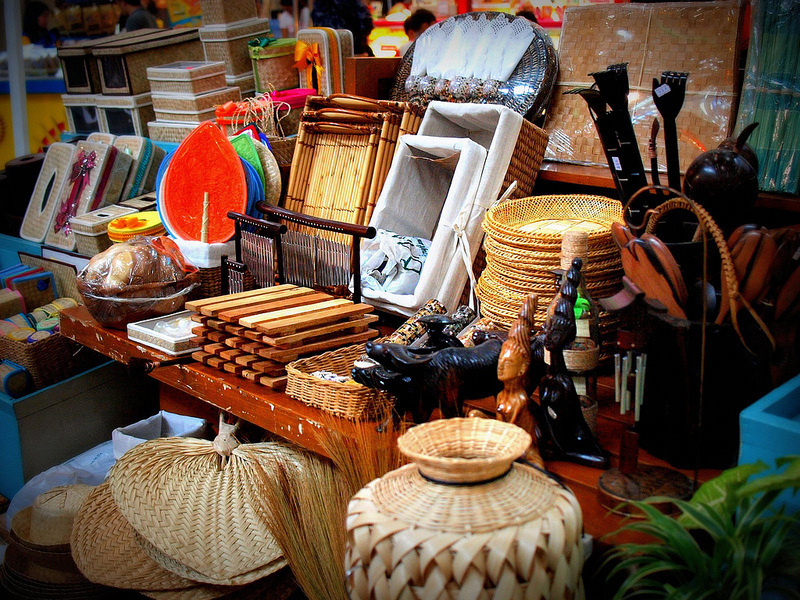 You can find native home furnishings like wooden chairs and coffee tables made of light materials like rattan or wicker. Decors and other handicrafts include baskets, trays, wooden sculptures, figurines, lampshades, pen holders, jewelry boxes and picture frames usually made from plant fibers. Native/indigenous musical instruments from the different tribes also make good conversation pieces for your living area. Apparel. International brands are available in malls. Aside from the usual shirts, pants and dresses found in malls and department stores, you can also buy tribal apparel and batik-printed cloth, shawls or malongs. They are usually made of woven fabric with patterns that often speak of a tribe's beliefs. You can complement your wardrobe with shawls and scarves -- tied, looped or displayed in several different ways. You may live by the cliché "shop 'til you drop". But that wouldn't be enjoyable, would it? That's why, there are also numerous restaurants located inside malls as well as near them. They can be fancy restaurants, fast food joints, local eateries and even stalls. Think: street food. They can be found near schools -- where they are affordable treats to students -- and government offices. There are even restaurants which serve crocodile meat-based dishes and salads that use locally-sourced goat cheese, thereby reducing food miles. For toddlers who don't see the joy in shopping, you can appease them by bringing them to the Philippine Eagle Center (PEC). The PEC houses several Philippine Eagles as well as other birds and a few mammals and reptiles. The keepers conduct lectures as well as a falconry show where the birds fly free for you to see the breadth of their wings. 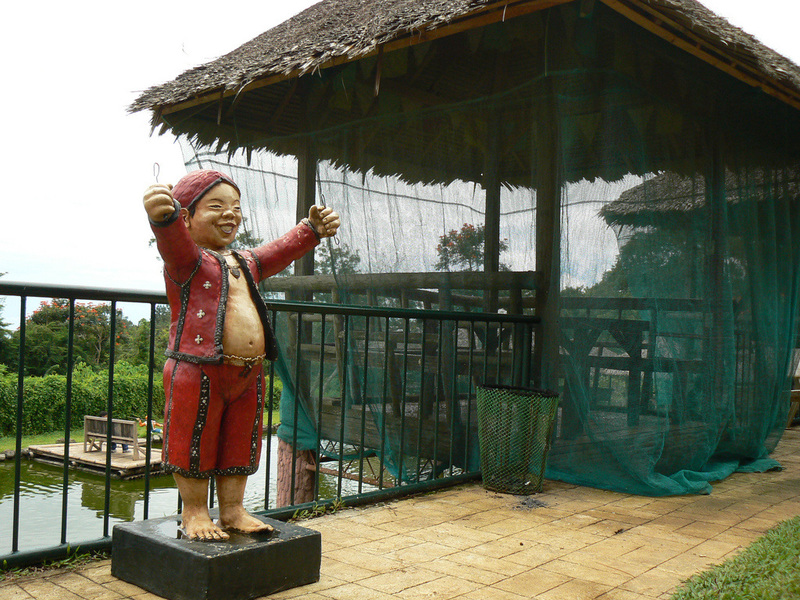 Another animal show can be witnessed at the Malagos Garden Resort nearby. It has a bird park, bird feeding and watching dome and a petting zoo. You can have your lunch at its restaurant and while away the time strolling through its gardens. Napoleon Abueva's (cited as the Philippines' Artist for Sculpture) sculptures are also residents of the vast garden. Children may also be thrilled to have encounters with crocodiles at the Davao Crocodile Park. The park, though, does not only showcase crocodiles but there are also other reptiles like snakes. It also shelters birds, an ape, and a tiger. 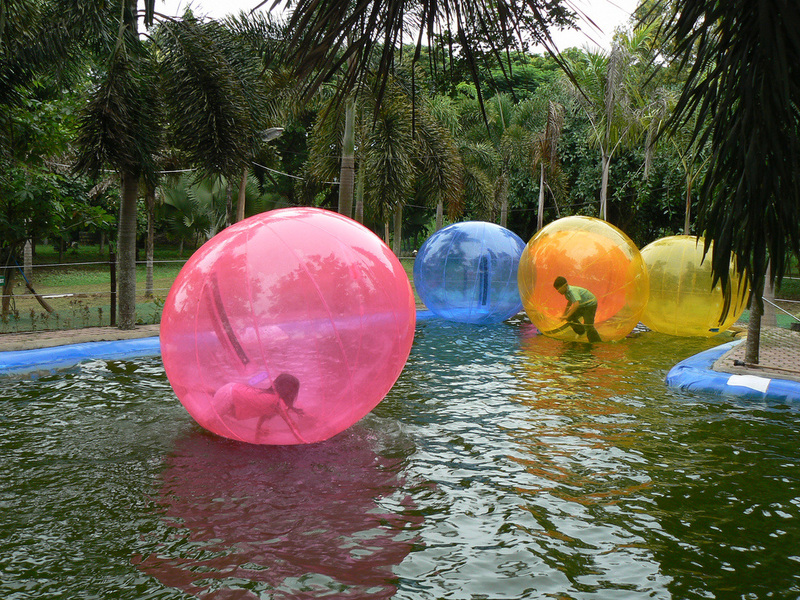 Aside from animals, you can try rolling down a slope inside an orb. Just make sure you can handle being turned over and over again inside a plastic ball. Dehydration can result if you keep throwing up even days after you're out of the ball. Other sports that teens, young adults, and not so young adults can experience in Davao City are river rafting, zip-lining and cable wakeboarding. If you're more interested in soaking up Filipino culture, you might want to visit The GAP (Good Activities of the People) Farming Resort. Even from its entrance, you will be greeted by a symbol of Filipino industry: the carabao. Though it is a farm, it has a lot of picnic areas, a restaurant, a pool, chapel and grotto, and function venues. It is also a park that has busts of heroes, life-size sculptures of Filipino indigenous people, animals, and characters of Filipino folklore. It is also a forest, an orchard, a garden, and a museum that includes a short Japanese tunnel. How would you like to be inside a ball? Other interesting places include: Museo Dabawenyo which presents Davao City's history and the different indigenous peoples that live in the city, People's Park, Mt. Apo Natural Park, the Shrine of the Holy Infant Jesus of Prague, Osmeña Park, Magsaysay Park, Davao Baywalk with its replica of the Little Mermaid and the statue of David, Philippine-Japanese Historical Museum, Eden Nature Park, and Loleng's Mountain Spring Resort.